Nowadays, people access the web using a wide variety of devices. These include PCs, tablets, smartphones and even feature phones. When designing a website, this presents both an opportunity and a challenge. The opportunity lies in the large number of potential users that a website can serve. The challenge also lies in making the website accessible across the sheer variety of devices – almost all of which have different screen sizes. Back in the day, web designers tackled the challenge by creating two versions of the same website. The main version would be calibrated for large screen devices like PCs. A mobile version (usually with the domain named .mobi) would serve smaller screen devices like smartphones and feature phones. This approach was tedious and expensive. Creating two versions of the same website made the site costly to create and maintain. As such most website owners chose to create only one version – the one the majority of its users were most likely to use. This of course meant missing out on some website visitors. In recent years, a new approach has emerged for solving this problem. This approach makes it possible to create a single website which can display perfectly on any device – irrespective of screen size. This approach is called responsive website design (or responsive web design). In simple terms, it is creating a website which is “responsive”. A website is considered responsive when it automatically adjusts itself depending on the device it is being viewed from. 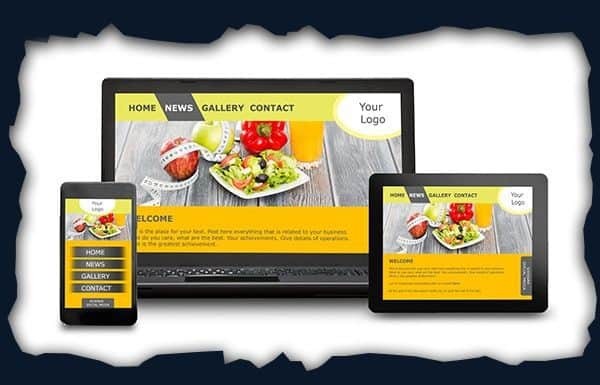 Such a website can change aspects such as its layout, text size, graphics display, etc to suit the specific characteristics of a specific device. Such characteristics include screen size, display colors and screen resolution. A responsive website looks slightly different depending on the device you use to view it. It may also behave slightly differently. The look and behavior (interactivity) is calibrated to suit the unique characteristics for that device. In essence, such a website provides the best user experience across a wide spectrum of devices. Without getting too technical, a website is made responsive using a CSS3 module called Media Queries. CSS is an acronym for Cascading Style Sheets. It is a language used to specify the visual aspects of a website e.g. colors, font-types and layout. CSS3 is the third (and latest version of CSS). It has a module called Media Queries which is used to implement responsiveness. A media query is simply an instruction which telling a browser to display a web page differently depending on certain screen characteristics. Such characteristics include width, height, color and resolution. Let us take width for instance. Consider three devices: a PC, a tablet and a smartphone. These devices may have widths 1366px, 1024px and 640px respectively. You can create a webpage layout with different number of columns for each width size. For instance, you can choose 3 columns for a PC, 2 for a tablet and 1 for a smartphone. You would typically create 3 sets of CSS display properties for each of the width sizes. Using a media query, you would instruct the browser which properties to display depending on width size. The same applies to other screen properties such as height, color and resolution. A media query basically makes your webpage “smart” i.e. it enables the webpage to automatically adjust to the device you are using to view it. This enables you to provide a richer user experience irrespective of the device. A responsive website offers access to every visitor irrespective of the device they are using. Basically, this exposes the website to the maximum number of users possible. For a business website, this can mean more customers and potentially greater profits. Non-responsive websites cut out other potential users. For instance, if a user has to scroll horizontally to read the text on the webpage, most decide to simply leave. As such, non-responsive websites tend to have a higher bounce rate. A responsive website offers a richer user experience. This is because it displays the content to suit their device. When viewed from a smartphone, a responsive website actually loads faster than a website with a mobile version. This is because for the mobile version, the user has to be redirected to the mobile version. By providing a richer experience, a responsive website increases the likelihood of visitors returning. Anyone who understands a website knows that a loyal user base is one of the key building blocks of website success. It is much cheaper to build a responsive website then to build two versions of the same website. It is also much cheaper to maintain. As such, from a budgetary perspective, having a responsive website is the more cost-effective option. Google’s announcement of search-engine changes sparked fears of “mobilegeddon” in early 2015. In the end, the drop in search engine rankings for non-mobile friendly websites wasn’t as dramatic as many had feared. Even then, mobile-friendly websites now rank higher in searches made from mobile devices. As such, responsive web design is one of the best ways of maximizing a website’s Search Engine Optimization (SEO). So, Do You Need A Responsive Website? Now that you understand the basics of responsiveness, do you need a responsive website? If YES, then you are in the right place. We offer a responsive website design service which can be customized to your specific needs. For a limited time, we are offering a $99/mo website design package. For a low cost website PLUS other goodies, please visit this link to learn more and sign up or call 303-200-1000 to speak to one of our website consultants! Therefore, if you need a responsive website, simply contact us right away. We’ll listen to you, and then design a website which will meet your goals and needs. Alternatively, if you already have a non-responsive website, we can redesign it to make it responsive. So, contact us right away, and we’ll build for you the website you want and that you deserve. Simply send us an email at sales@seozones.com or call 303-200-1000 right now. We look forward to hearing from you!